You are here: Home / Feedback & Reviews / beautiful land! From the start of planning our trip, with timely responses to the final day highlight hike to the Tiger’s Nest Monastery, Little Bhutan team were simply excellent! 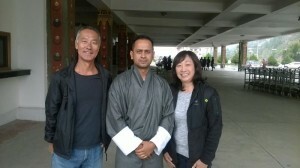 And thank you to Phuntsho and Deepak for a most memorable and valuable Bhutan experience. We appreciate you sharing detailed & clear explanations on the culture and history of your country, as well as ensuring our comfort and safety throughout our stay. We would not hesitate to recommend Little Bhutan to anyone visiting this beautiful land!